Often during heavy rains, winds, or falling debris, homes businesses can experience roof damage. For some, the first instinct is to apply a roof tarp, looking to quickly solve the issue and attempt to reduce the possibility of additional damage. Roof tarps allow you to have a quick solution and a gap of time until better weather conditions allow for safe inspection and repair. 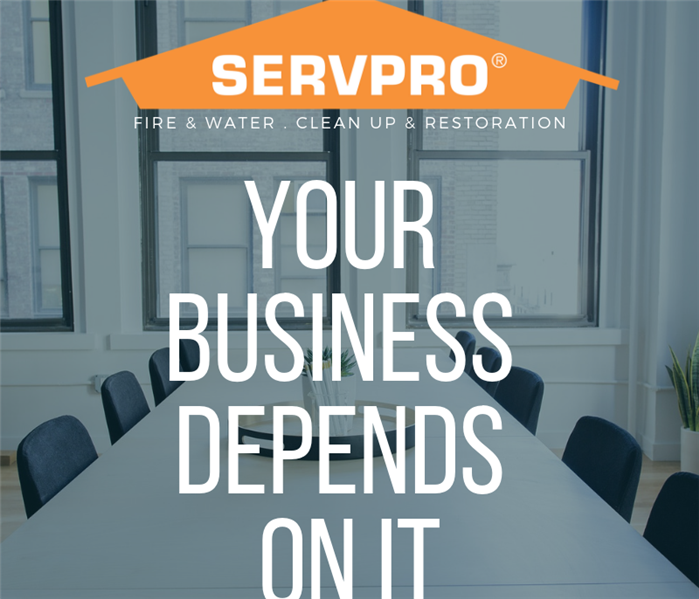 SERVPRO ofSouth Rancho Cucamonga is here to assist homeowners and commercial businesses with their water mitigation and mold remediation needs. As a home or business owner, you have the right to protect your property and mitigate as quickly as possible. Here at SERVPRO of South Rancho Cucamonga, our experienced team of technicians, whether having coverage from your insurance company or not, is here to assist in avoiding further water damage, and possible mold issues. For your water mitigation needs, call SERVPRO of South Rancho Cucamonga at (909) 759-0189, we're here to service you. SERVPRO has the experience necessary to inform you of the downsides of excess water in your home. The removal of excess moisture from your Rancho Cucamonga home should be a matter of top concern at all times. That is because excess water may find its way into your home through several access points. These include unattended taps, leaks in pipes, excess precipitation, and outright negligence, to mention but a few. Regardless of its source, such water may adversely impact your home. 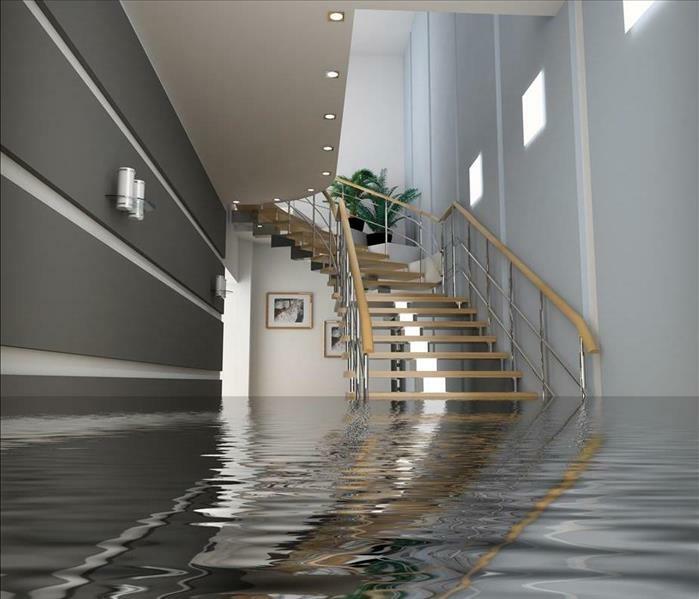 In the discussions below, SERVPRO of South Rancho Cucamonga describes the dangers of water damage and some of the various means and ways of mitigating them. Carpets are highly absorbent. They easily soak up plenty of water which subsequently weakens its fabrics. If the situation is left to go on unabated, this may often lead to the diminished overall lifespan of the carpets. This means that your carpets can end up being obsolete before their time. SERVPRO of South Rancho Cucamonga knows too well that wooden pieces of furniture are also very susceptible to excess moisture. That is because such moisture often gets absorbed by the wood and in so doing dampens those wooden components. The resultant effect is rotting of the same and substantially diminished lifespan. Apart from that, they also weaken the furniture so much so that, they may subject anyone who sits on them to the risk of falling off. Foundations of the buildings may be weakened by excess moisture. Moisture does weaken the foundations if the underlying soil shifts. This makes the soil quite weak as not to offer the required support. This issue may lead to the overall collapse or cracking of the foundation if not mitigated in time. SERVPRO points out that hidden moisture can encourage the growth and proliferation of mold. Molds and other fungi thrive well in areas with excess moisture. They can lead to health effects. Count on us, SERVPRO of South Rancho Cucamonga, to remove water and dry out your home or business by calling (909) 758-0189 to request a quote or book an appointment. There is nothing more exciting than a backyard barbecue with friends and families in the summer. 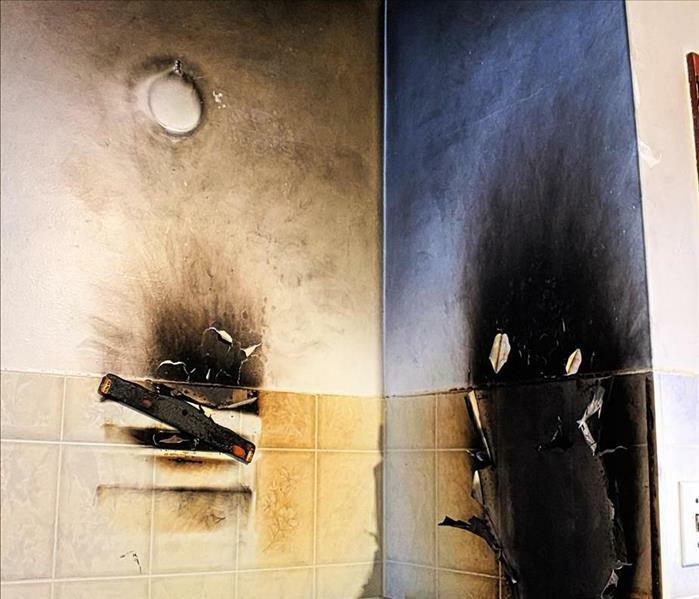 There are a few precautions to take, however, for how to prevent house fires when grilling. If you’re grilling on the deck, be sure to place non-flammable pads beneath your grill to prevent the start of fire in the event of dropped food or coals. Also, be sure the grill is attended to at all times. Call a friend over to watch the grill if you must step away, even if only for a minute. If there is no one around to watch the grill, turn off the propane. Though maintaining a successful business in Rancho Cucamonga, Ca takes dedication, time and money, water damage can quickly create a variety of issues for the company. Making repairs and recovering products after the damage can be costly, but there are various steps you can take to make the process easier. Because of this detailed investigation, any homeowner filing a claim in Rancho Cucamonga, Ca should be prepared for a potentially lengthy claim process. Your sellers may have trouble spots to address before you list or schedule a home inspection. Clients may choose to handle these issues themselves to avoid filing an insurance claim for the damage because it isn’t covered by their policy and can effect the home’s CLUE report. Unfavorable CLUE reports can lead to increased premiums and policy renewal issues for property owners. We love helping our real estate friends get their properties buyer ready! Get your properties ready to showcase to potential buyers?! Let us know if you need an extra hand in ensuring everything clean and mold free. Give us a call and find out how we can work together! Have you ever considered the possibility that air quality in your office could be effecting work production? Proper maintenance, clean air ducts and moisture control are just some of the necessary responsibilities to ensure a workplace is safe and secure for employees and customers. 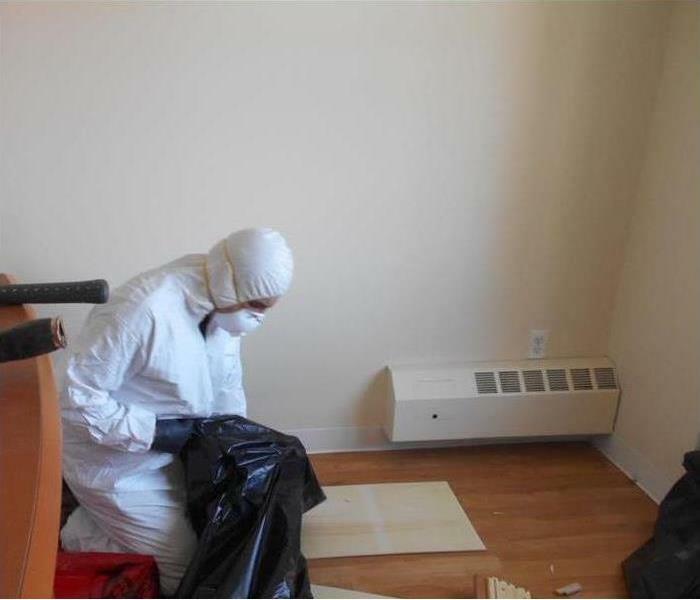 Technician removing moldy material from the home. For many households, chlorine bleach is generally seen as your “go-to” cleaner for tough jobs. While bleach is well-known for its disinfecting properties that doesn't mean it's the best choice for mold - it has distinct drawbacks when cleaning flood impacted buildings. It is a convenient cleaner and stain remover for hard, non-porous surfaces. Bleach is not made to “soak in”, therefore, its disinfecting properties are limited to a hard surface like tile or glass. If used on porous materials, such as wood and drywall, bleach will stay above the surface and only kill the mold on the surface, while the water is absorbed in. 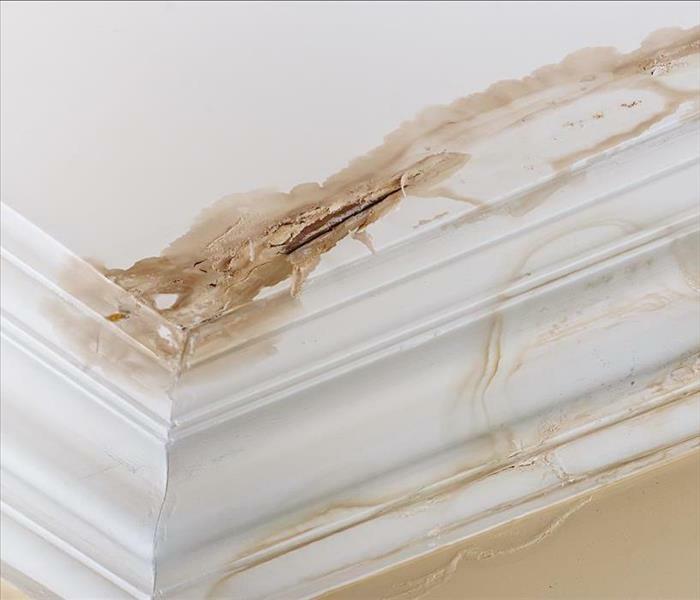 The surface mold looks gone, but the fact is, if the mold is not removed from the material, it will most likely return and make your mold problem worse in the long run. Mold remediation requires a cleaner to reach deep down into wood and other porous building materials. Further, its effectiveness in killing bacteria and mold is significantly reduced when it comes in contact with residual dirt, which is often present in flooded homes. If bleach water comes into contact with electrical components and other metal parts of mechanical systems it can cause corrosion. Bleach water can also compromise the effectiveness of termite treatments in the soil surrounding the building. SERVPRO of South Rancho Cucamonga cares about the proper restoration of your home or business. We have the know-how and the specialized equipment needed to assess and/or repair your damage. Water damage can happen very quickly. Respond just as fast by contacting SERVPRO for water removal and remediation services. The kitchen is a common place to experience water damage. Water lines to dishwashers, refrigerators, and of course the kitchen sink. An under-sink leak, especially if it is a slow leak that goes unnoticed for a while, can cause warping of wood and compromise the wall behind the cabinets. Just peeking at the plumbing under the sink on a regular basis can point out a small problem before it turns into a big issue. SERVPRO of South Rancho Cucamonga technicians came to a water damaged home in Rancho Cucamonga where a leak in a pipe under the kitchen sink had left water in the floor and bottom of the cabinets. 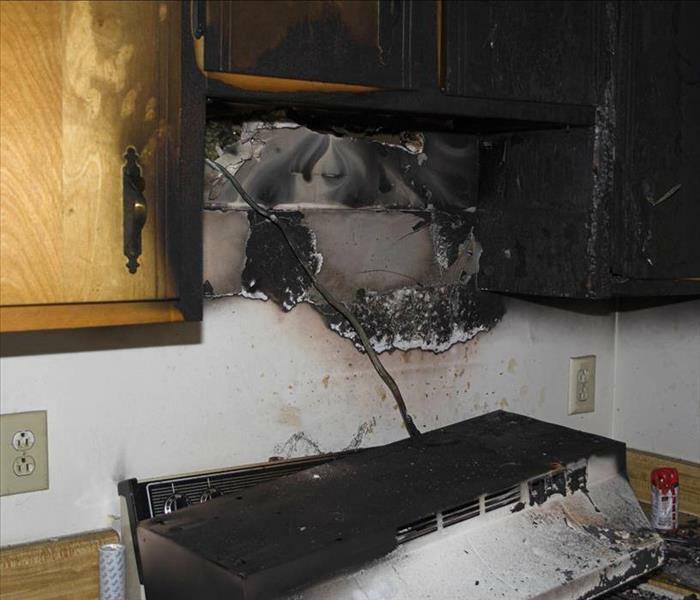 The technicians determined the scope of the water was contained inside the kitchen area and had not spread to other areas of the home. Technicians vacuumed the standing water from the tile flooring using portable wet/dry units. Once the standing water was removed, upon inspecting the interior of cabinets, the technicians determined while the wall at the back of the cabinets was not wet. However, the baseboards around the bottom of the cabinets were retaining moisture. SERVPRO of South Rancho Cucamonga techs removed the baseboards to ensure the wood underneath could be dried entirely to avoid potential secondary damage. No weep holes or other additional drying methods needed. Positioning air movers to blow moisture up and out of the room, combined with dehumidifiers to rapidly lower the moisture in the room, the kitchen dried quickly. Using moisture detectors to ascertain the area was thoroughly dry, the next step in the restoration could begin. The baseboards were inspected to determine if any warping had occurred. Fortunately, they dried straight so they could be put back into place. The cabinets and flooring were wiped down with our professional-grade anti-bacterial and anti-fungal solutions to leave the surfaces both cleaned and deodorized. Call SERVPRO of South Rancho Cucamonga when you have water damage that needs addressing right now. Our emergency services are available to help you 24/7. Call (909) 758-0189 and one of our certified experts can start the process of returning your kitchen to normal. 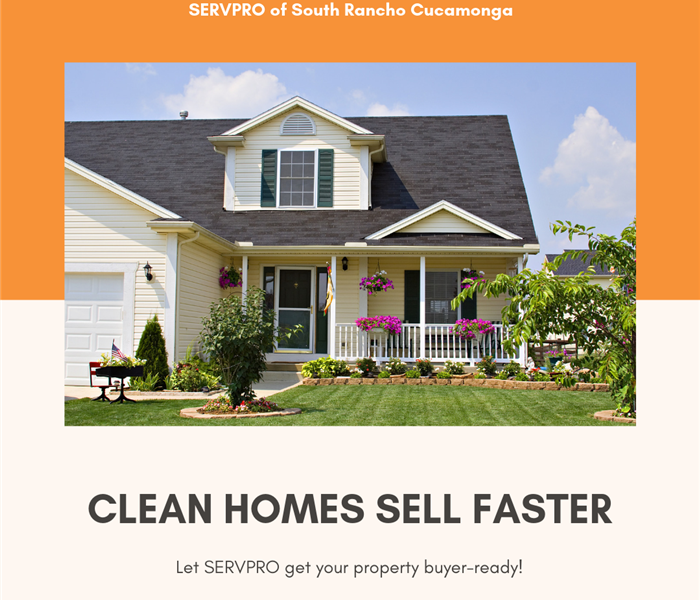 Click here for more about SERVPRO of South Rancho Cucamonga. 4/18/2019 - Roof water damage in Rancho Cucamonga?